The Taste of Salt tells the story of a black family dealing with addiction over the course of two generations. Josie has loved the water since she was a little girl. She is fulfilling her dream position as the only black senior-level scientist at the Woods Hole Oceanograhic Institute. One thing she isn't so proud of is her family back in Cleveland. Her father pushed the family away with his drinking. Her brother is coming apart at the seams following in his alcoholic father's footsteps. Her mother spent years giving love to her family and being pushed away. Their lives are way more complex than any science Josie ever worked with as a marine biologist. The Taste of Salt has sat in my NOOK library for at least three (3) years. The cover is very appealing and true to its title. The plot summary is serious yet interesting. But the subject matter of alcoholism seemed a bit heavy. 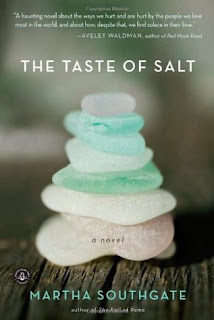 The Taste of Salt is one of those books you have to be in the mood for. If there were such a thing, I would consider this genre: plain truth fiction. Martha Southgate takes it there with no minced words or timid characters, and I appreciate that.